Surgical orthodontics (also known as orthognathic surgery) corrects jaw irregularities to improve a person’s ability to chew, speak, and breathe and for improved facial appearances. 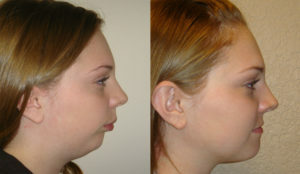 Just as orthodontics corrects problems with tooth position, surgical orthodontics corrects problems with jaw position. Moving the jaws also moves the teeth, so braces are always performed in conjunction with jaw correction to ensure that the teeth are in a proper relationship with the new jaw position. Surgical orthodontics is a treatment is for non-growing adult patients with improper bites, irregular jaw position and facial aesthetic concerns. Jaw growth is usually completed by age 16 for girls and 18 for boys. All growth must be completed before jaw surgery can be performed. However the pre-surgical tooth movements can begin one to two years prior to these ages. What is it like to have surgical orthodontics? During orthodontic treatment your teeth move with the braces. In cases where surgery is required, the bite generally gets worse rather than better prior to surgery. However, when your jaws are placed into proper alignment during orthognathic surgery, the teeth will then fit into their proper positions. Surgery is performed in the hospital by an oral surgeon, and can take several hours, depending on the amount and type of surgery needed. In lower jaw surgery, the jawbone is separated into three segments. The middle section or tooth-bearing portion is moved forward or backward, as needed. 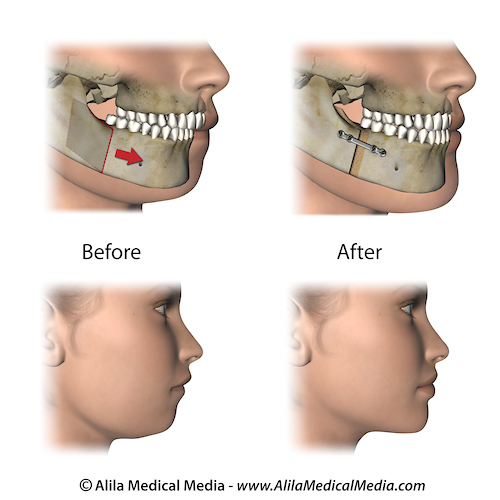 In upper jaw surgery, the jaw can be repositioned forward or backward, or the jaw can be raised or lowered. Certain movements may require the jaws to be separated, with bone added/removed to achieve the proper alignment and stability. Other facial bones that contribute to alignment may also be repositioned or augmented. Once surgery is completed, you should be able to return to school or work within two weeks. Initial healing can take about 4-8 weeks. Dr. Bailey will then detail the position of your teeth to create an ideal bite. Most cases take about 6-9 months after surgery to finalize. After your braces are removed, you will wear a retainer to maintain your beautiful new smile.